The traditional Japanese fan dance is usually performed by a young woman, either singly or in a group of dancers. It involves using a hand-held fan as a prop. The dancers often wear brightly colored Japanese kimonos, and have elaborately arranged hair and bold make-up. Fan dancing involves slow, deliberate movements, figures and poses, which sometimes tell a story. 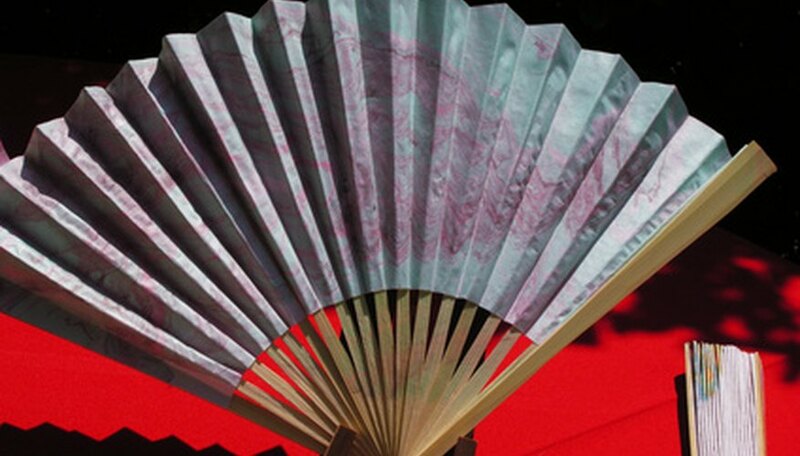 A traditional Japanese fan can be made from paper, feathers or thin material mounted on slats. Today, the fans used in fan dancing are usually made from paper, and are elaborately painted and folded. The fans must be made using a paper pivot attachment, a mechanism that allows the dancer to fold and open the fan with a single flick of the wrist, so that the fan may be easily folded and twirled in the movements of the dance. Fan dances are usually accompanied by traditional Japanese music. The earliest recorded fan dances in Japan took place in 6th century AD, during the reign of Emperor Jimmu. Fan dancing was a dance of high social status, and only performed at court, among aristocrats. The dance would be accompanied by traditional Japanese music, and was often used to portray a story, as many of the gestures are symbolic. It was popular at court for many centuries and formed an integral part of celebrations, including coronations and marriage ceremonies. The tradition of fan dancing continued throughout the imperial lineage. Traditional fan dancing can still be seen in Japan today, although it is no longer the dance of aristocrats. It is performed with hand-painted fans, usually made from paper, to the accompaniment of live music, often involving singing and the playing of a shamisen (a three-stringed instrument). Sometimes fan dancing is performed for western audiences with faster and showier choreography, accompanied by recorded music, but this is not traditional fan dancing. Fan dancing was originally an aristocratic art form, and the fans themselves could be used as indicators of social status. The use of hinoku (Japanese cypress) in the decoration of fans was regulated according to the social standing of the fan's owner. Japanese craftsmen even made fans from ivory, mother-of-pearl and sandalwood for those of high rank. Today, Japanese fans no longer represent social significance, but they are symbolic of friendship or loyalty, and can be exchanged as signs of good will. Fan dancing forms a key part of representations of Japan in Western popular culture. In "The Mikado," a comic opera by Gilbert and Sullivan, a westernized version of fan dancing is performed both by the ladies of the chorus and by the heroine. "The Mikado" was first performed in London in 1885, and proved hugely popular. The 1999 Mike Leigh film, "Topsy Turvy," which tells the fictional story of the making of "The Mikado," focuses more than one scene on the importance of the fan dance in displaying the habits of aristocratic Japanese women. "Memoirs of a Geisha," a novel by Arthur Golden (published in 1997), devotes many pages to fan dancing and the significance of mastering the art of fan dancing when becoming, as a geisha must be, a truly accomplished woman. Emma Murray has worked as a writer for the past four years, and is published in student, local, and national publications, including "The Isis Magazine," "The Evening Chronicle" and "The Sunday Times" Culture Section. She is a first class graduate in English language and literature from the University of Oxford.